When I made a list of recipes to try for this marathon, I made it a point to pick as many as possible choices for each alphabet. The idea was that I can cook whatever I can depending upon the mood and the ingredients I have on hand at the time of cooking rather than sticking my guns at one dish which may have proved not feasible at all. I went on to cook about 2 dozen different pulaos and biryanis in the past couple of months that we my husband somewhat hit a vexation point just at the mention of it. He enjoys them once in a while but not when his wife is determined to experiment and cook all known varieties, in the span of few weeks. My initial plan was to cook a 'ulava chaaru biryani' for the alphabet "U'. I zeroed on a particular recipe and bought a packet of horse gram for the first time in my life. I kept delaying the preparation until this weekend to break the biryani monotony but it turns out that I was no longer in the pulao / biryani mood. 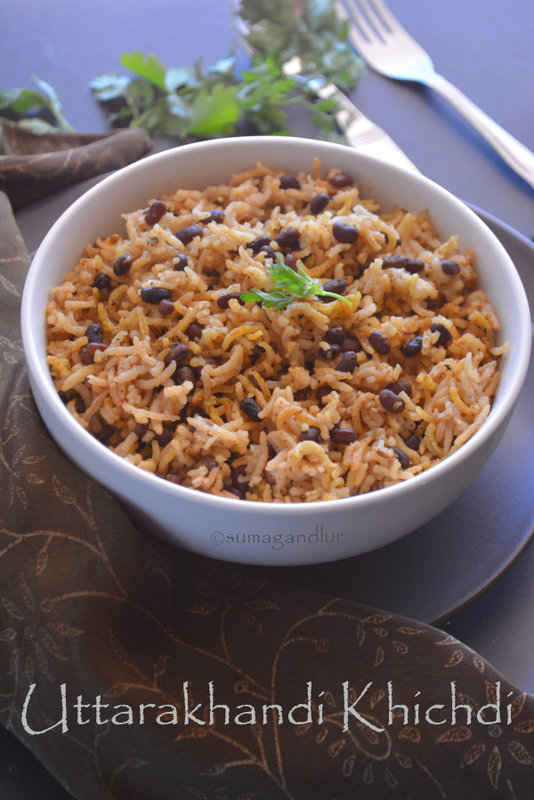 I therefore turned to this easy-breezy kind khichdi, the one pot meal being a dish which I don't get tired of, irrespective of regional variations. I tried to pick a handful of khichdis for this month's marathon, each with at least some minor variations. This one pot khichdi which is also called as tilantha khichdi or tilwali khichadi that I found on youtube, comes from the Uttarakhand region as the name suggests. It doesn't use any garam masala either in whole or ground forms, which seems to be a norm in most of the masaledar khichdis. 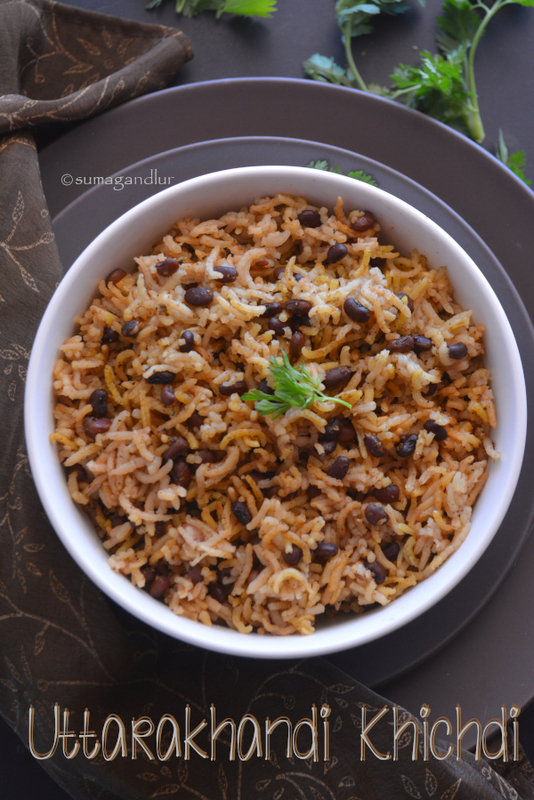 This version is prepared using rice and small sized lobia / black eyed peas which are brown in color. I used chori beans instead. The khichdi is supposedly preferred during the winter months as sesame seeds and ginger are natural warmers. A paste made with toasted sesame seeds, generous amounts of ginger and garlic and green chillies is used in this khichdi preparation. I omitted garlic from the recipe but feel free to use it liberally if you prefer it's addition. The delicious khichdi is quite spicy on it's own, thanks to green chilies, chili powder and ginger in the recipe. 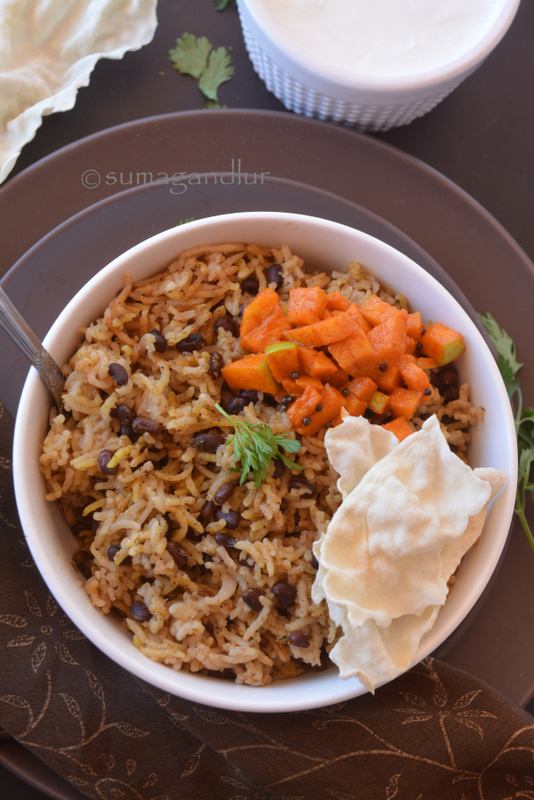 Serve it along with some plain yogurt, papad, and ghee to make it a wholesome and filling meal. * Soak beans overnight. Drain after the soaking period. * Toast sesame seeds on low flame until they start to crackle and turn off the stove. Let them cool. 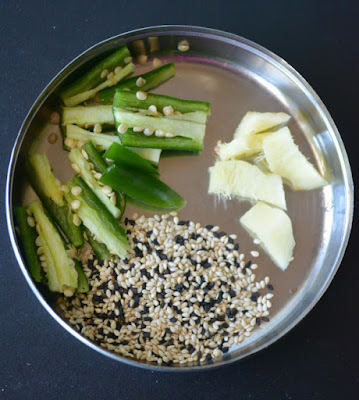 * Grind sesame seeds, ginger and chilies together finely adding water as needed. * Heat ghee directly in a pressure cooker. Add cumin seeds and when they start to brown, add drained beans and saute for a minute. Next add the sesame seed paste and fry on low flame for about a couple of minutes. * Next add salt, coriander powder, turmeric and chili powders and stir well. 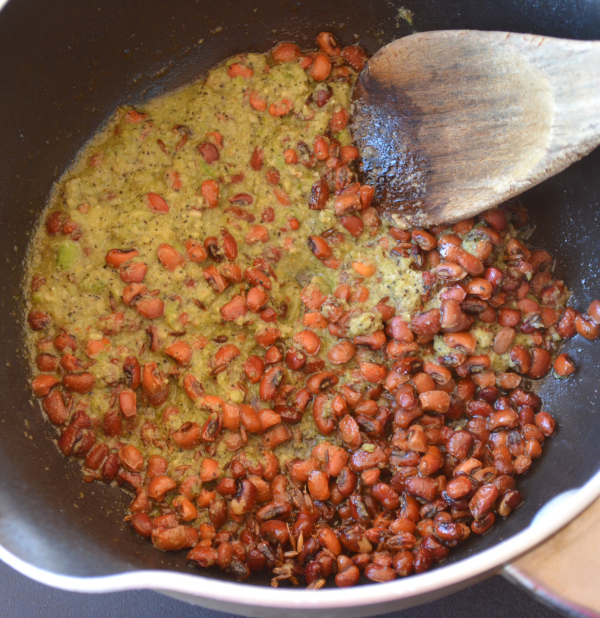 Continue to cook until the paste thickens and the beans are coated well with it, about 3 - 4 minutes. * Rinse and drain the rice. Add it to the cooker and saute for few seconds. Add water and bring the mixture to a boil. Close the lid and pressure cook for 4 to 5 whistles. * Wait for few minutes after the valve pressure is gone. Open the lid of the cooker, gently mix and serve warm. Check out the Blogging Marathon page for the other Blogging Marathoners doing BM#99. Tahri is one dish from the bygone era that fortunately didn't need any substitutions since it is vegetarian in origin. 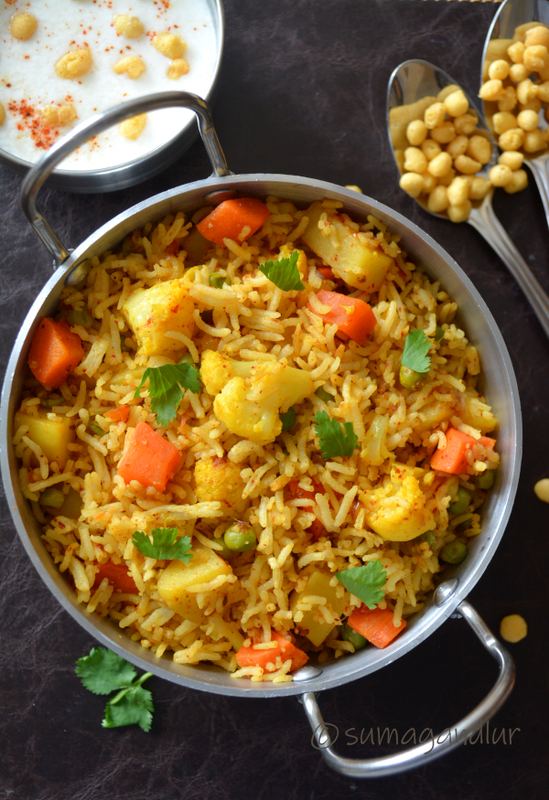 Tehri also called as tahri, tahiri, or teheri is a vegetarian one pot rice meal that had interestingly found a place in the royal kitchens of Awadh, which are almost synonymous with their lavish, non-vegetarian version biryanis. It is believed to have been first created for the vegetarian book keepers of the Nawabs. It makes sense that the royal kitchens catered to it's staff considering that it was a period when there was no practice of either carrying a lunch box or eating out. Tehri seems to have gained quite popularity during second world war when meat prices substantially increased and potatoes became a favored alternative to meat in biryanis. 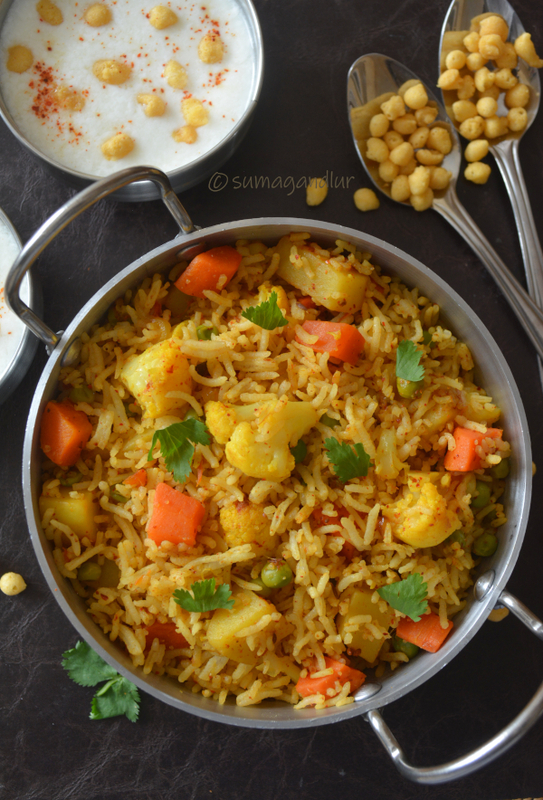 Apart from north India, primarily Uttar Pradesh where the dish has originated and is cherished, it is also quite popular one in Pakistan and Bangladesh where it no longer remains a vegetarian dish. It seems to be a popular street food of Kashmir too. I honestly enjoy this delicious tehri more compared to the biryanis where I need to convert meat based ones to 'vegetarian' ones. It is probably because the dish is perfect as it is and honed over time and needs no modifications. It is quite easy to put together this one pot comfort meal that needs no fancy ingredients. 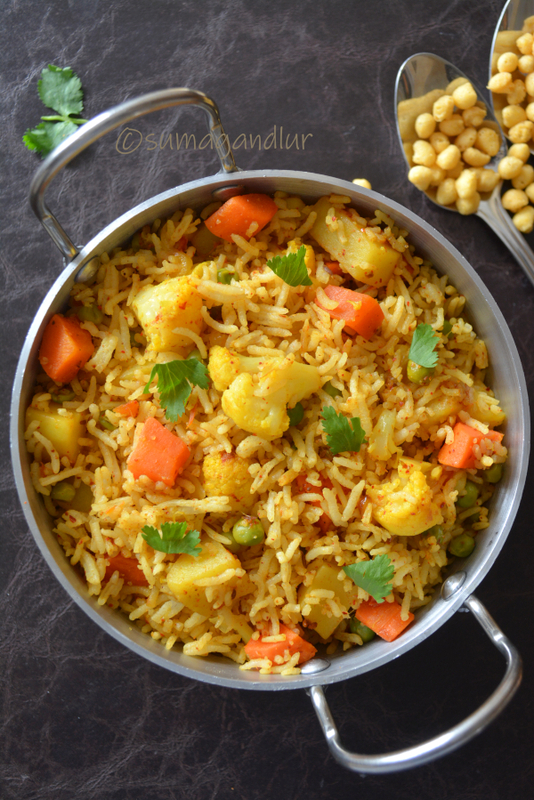 Unlike a biryani preparation where rice and vegetables are cooked separately, rice in this case is cooked along with spices and vegetables in one handi / pot. Typically though potato is the commonly used vegetable in tehri, one can experiment with any preferred vegetables. * Heat ghee directly in a small pressure cooker and add cumin seeds, bay leaf, cardamom, cloves and cinnamon. * When the cumin starts to brown, add onion slices and saute until golden brown. * Next add the ginger - garlic paste and saute until the raw smell leaves. * Next add the tomato and green chilies. Cook for a couple of minutes. * Next add turmeric, coriander powder, garam masala, chili powder and salt, stir and mix well. * Then add all the vegetables and saute for a minute. * Wash and drain the rice. Add rice and saute well until the rice is coated well with ghee and spices. * Add 3/4 cup of water and pressure cook for three whistles. * Wait for few minutes after the valve pressure is gone. Fluff the rice. Drizzle a bit of ghee and lemon juice over and garnish with cilantro before serving. I initially thought of including some international recipes in my list to pull off the difficult alphabets in the series and checked with Srivalli, the BM coordinator to see whether I can do so. There was a choice of going with a series of completely either Indian or International biryani / pulao / khichdis for this marathon but not a mix and match kind stuff from both, she confirmed. 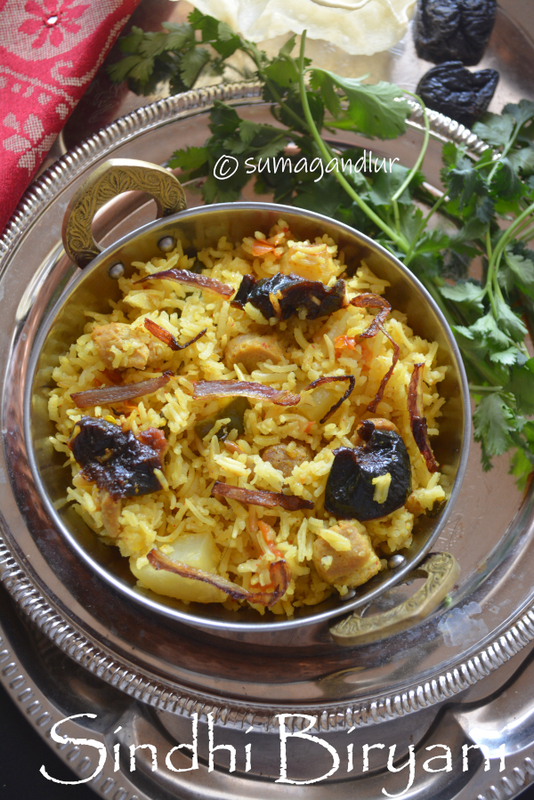 I chose to go with Indian rice dishes and so was in two minds about trying this biryani as my 'S' dish. Sindhi biryani has become a part of Pakistani cuisine since it is said to have originated in the Sindh province there. However this dish with the Mughalai touch obviously must have originated in India centuries ago and is not a recent creation. This meat and potato based biryani seems to be a quite popular one in Pakistan in general and in the Sindhi community in particular which resides on both sides of the border. In fact it is so popular in Pakistan that it is served in most of the flights of 'Pakistan International Airlines'. What sets this biryani apart from the other regional versions is it being on a spicier and zesty side and also the proportion of masala to the rice used being slightly more. 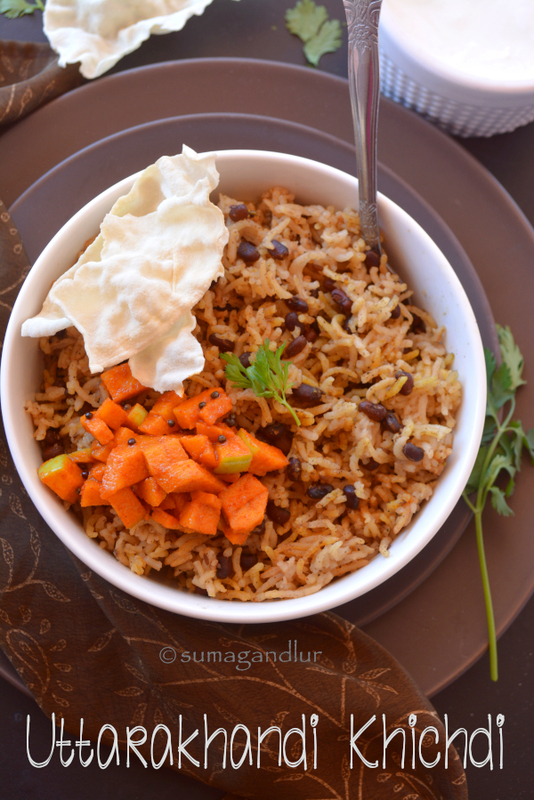 The usage of khatta dahi / sour tasting yogurt, generous amount of chilies and spices, mint, and tangy aloo bukhara (dried plums / prunes) are the prominent features of this biryani. 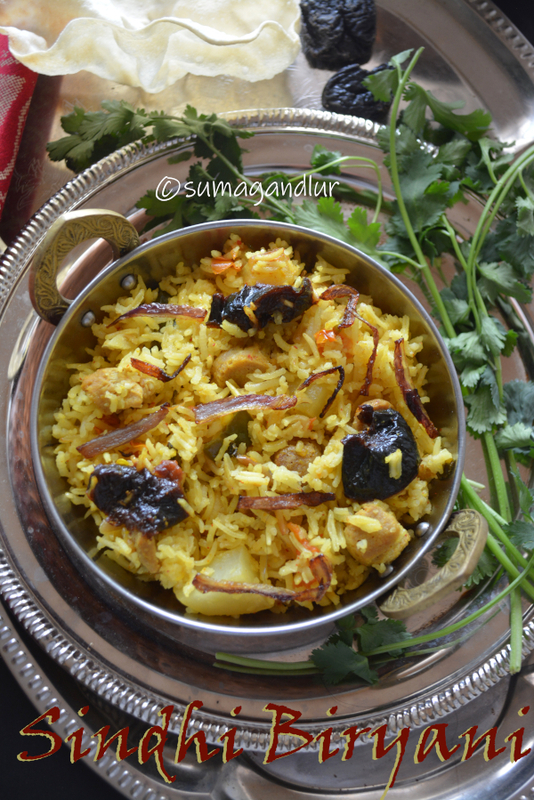 The biryani is layered and cooked in dum style. I substituted soy chunks for meat and pressure cooked it for a quicker version. 1. Combine all the ingredients mentioned under 'to marinate' in a bowl while doing the frying part or until they are needed. 2. I advise against soaking dried prunes since they turn mushy when cooked. I instead chopped each into 3 or 4 pieces since they are big and added them at the end. 3. Mix warm milk and saffron in a small bowl and keep aside. * Heat about 1/4 cup oil in a small pan, add onion slices and fry them until golden brown. Take care not to burn them, by stirring continuously. (I did the shallow frying but they can be deep fried.) Remove the fried onions with a slotted spoon and place them on a paper towel lined plate. Potatoes can be fried for a couple of minutes or fully at this point. * Heat 1 or 2 tbsp. 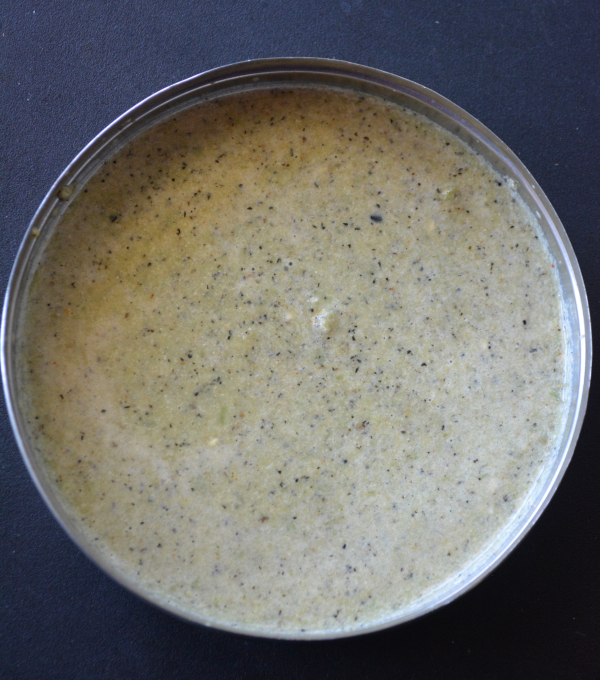 oil directly in a small pressure cooker or a pan. 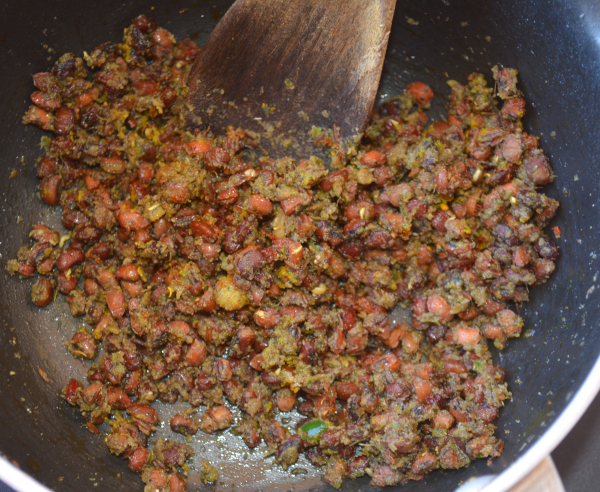 Add cumin seeds, pepper corns, red chilies, cloves, cardamom, cinnamon and bay leaf. Saute for few seconds and add 1/2 cup chopped onion. Fry until they turn pink. * Next add ginger - garlic paste, green chilies and saute for few seconds. Add tomatoes, turmeric, mint and cilantro leaves, chili powder if using to the pan and cook until tomatoes soften. Next add prunes, soy chunks along with the marinade, salt and rice (that is washed and drained). Saute for about a minute and add 3/4 cup water and the saffron milk. Close the lid and pressure cook for three whistles. * If using a pan and not using a pressure cooker, then bring the mixture to a boil and close the lid. Cook on low flame until rice is cooked, for about 15 - 20 minutes and turn off the stove.